American Wine – There’s more than just California! American Wine has exploded over the last twenty to thirty years. The number of wine regions and wine regions producing quality wine has helped with this explosion, but does the average American wine drinker really know that there are more wine regions than just California? Sadly, it seems not to be the case. For those of us who love drinking local wine, it seems we have some educating to do! Sure California produces great wine. It also produces nearly 90% of the wine made in American. Grocery store wine aisles, restaurant wine lists and even local wine bars are all full of California wine. California is known for its big, bold reds with high alcohol content. We would argue that these wines are overdone and take away the true essence of grapes when compared to old world wines. For those who don’t know, old world refers to Europe and the Middle East from where wine grapes originated in nature. 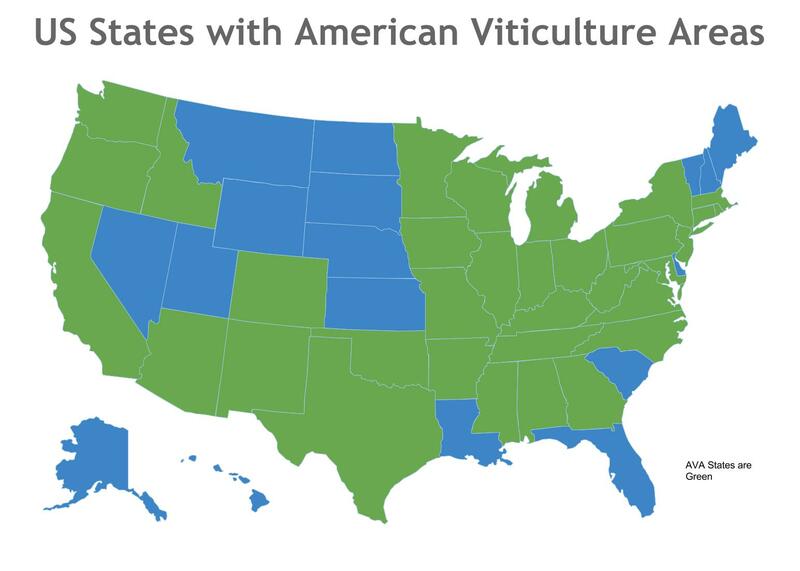 There are 32 other wine producing states recognized as having an American Viticulture Area. Given California’s dominance in producing American wine, how are other wine regions going to breakout? As the saying go, it takes a village! Those of us fortunate enough to live near other American wine regions need to step up our game. We need to get out and visit local wineries. We need to buy local wine. We need to insist that local restaurants, particularly those claiming to represent the local food movement, add local wine to their wine lists! We need to introduce our friends and family to local wine. We need to share our experiences on social media. We need to attend events at local wineries. In addition, when visiting local wineries, we need to make sure that local grapes are being used. If you’re not sure, ask! We need to insist on high quality. If a wine’s not good, say so. Let them know! So, what wine regions should you look at besides California? We, of course, are partial to North Carolina. Quantity and quality have continued to improve. 2015 was a fantastic growing year across the state. We expect 2015 to be THE vintage in North Carolina. Washington and Oregon should be considered. They account for over 4% of the wine produced in America. Other areas to consider are Missouri, famous for Norton. If you haven’t tried Norton and you like big bold, jammy wines, you’re doing yourself a disservice. Texas is another upcoming and coming wine region going Spanish, Italian and Rhône Valley grapes well. New York with the Finger Lakes and Long Island is producing high quality wines. The Finger Lakes in particular are now regularly reviewed in major wine magazines like Wine Spectator. Finally, Virginia can’t be overlooked. Just like North Carolina, quantity and quality have increased over the last several years. Virginia is producing superb Petit Verdot, Petit Manseng and Viognier just to name a few! American wine is diverse as our country. Let’s all do our part in helping make sure that diversity is better known. Drink local, explore new wine regions and share those experiences with others! There is more to American wine than California! Get out there and explore!